After all that, I was able to begin weaving. We started with a header in plain weave and then moved on to a twill, the characteristic weave of tartans. 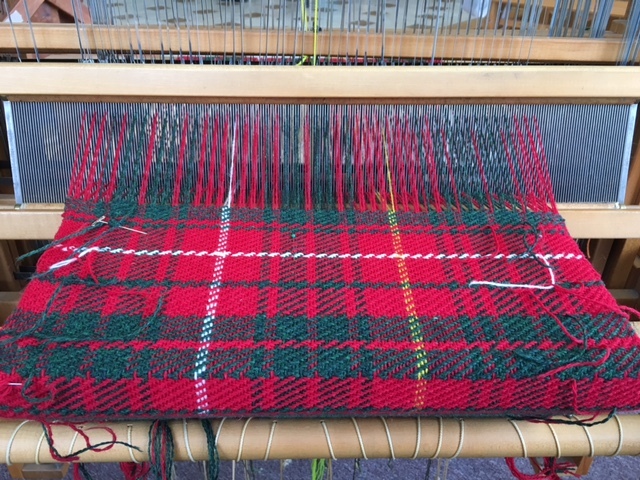 By my third session, I was ready to start following the tartan pattern, or sett, in my weft. When I dressed the loom, I set up the warp according to my sett. When I do the actual weaving, I am adding the weft or horizontal pattern, still following the sett. Now it is starting to really look like a tartan! 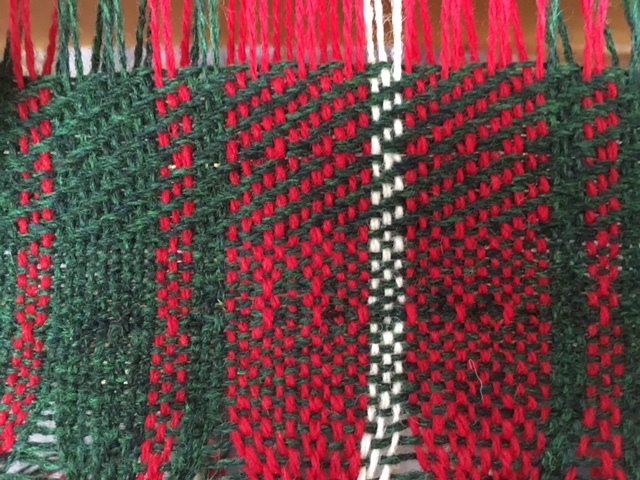 This week I spent the whole session weaving, making real progress on my tartan. When I was almost at the end of my session, I discovered a mistake in the warp, an extra small green and red stripe in the pattern. I’d already fixed a few mistakes in the weft, by un-weaving, but this wasn’t fix-able. I don’t know if you know this about quilters, but we like to point out our mistakes, even when we know that no one else (except maybe another quilter) notices or cares. We also live with our mistakes when we can’t do anything about them. Sometimes we do rip things out and fix them, but often enough we just have to leave them alone. Amish quilters supposedly add an intentional mistake because it would be presumptuous and prideful to make something perfect. This was called a “humility block.” It’s a good story, but probably not true. The fact is, mistakes happen and quilts (and tartan cloths) are still beautiful, perfect or not. Kind of like people, a little tangled. This entry was posted in Color, Life Lessons, Quilting by Christine. Bookmark the permalink.